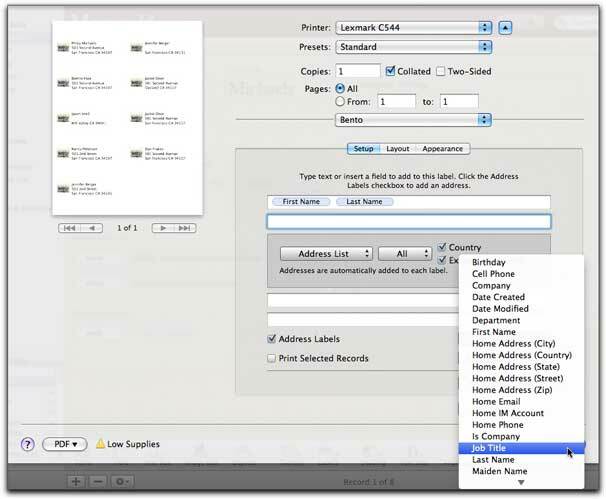 With the release of Bento 4, Filemaker's consumer-oriented database application offers vastly improved printing features, making it possible to create and print mailing labels without any Address Book voodoo or other parlor tricks. But Bento handles these printing tasks in a fashion far different from any other application that you may be using. 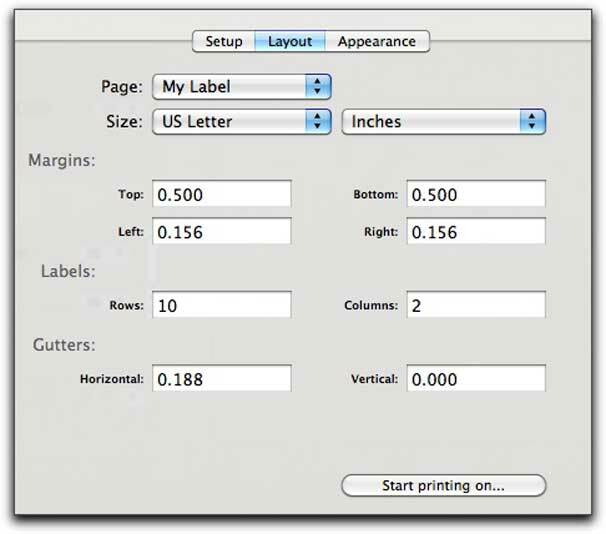 First select the collection that contains the data you want to print on your labels. Setup: Unlike most database applications, which require you to create some kind of label document and then merge your data into that document, Bento handles the layout and merging of data from within the application's print dialog. When you select File->Print in Bento, you now have two options: Print Table/Form... (Command-P) and Print Labels... (Shift-Command-P). Selecting the latter opens a print dialog that provides all usual the print options, but you'll also see three tabs‚ Setup, Layout, and Appearance‚ that you use to configure Bento to print your labels. Before you select the label printing option you first need to select the Bento collection (under Libraries) that contains the data you want to appear on the label. Once the print dialog is open, select the Setup tab and you'll see five text fields you can use to type your own text or add fields from your Bento database. To begin adding merge data, place your cursor in one of the text fields and then using the Insert Field button select the fields that you want to have appear on your label. As you add each field, make sure you add spaces between each one. Just below the five fields is a checkbox titled Address Labels. 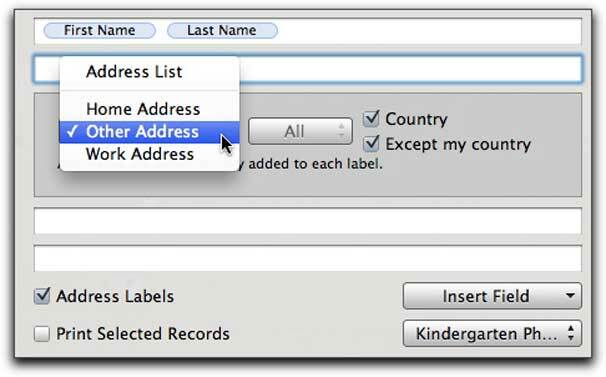 If the collection you are using is based on the Bento collection that displays your Mac's Address Book app data, putting a check in this box automatically inserts address information into your labels. Once checked, you can choose from the Address List pulldown menu whether you want to use a contact’s home address, work address, or some other address. You also have options for adding images to your labels and for printing only the contacts you have selected in your Bento collection. To add merge data, place your cursor in one of the text fields and, using the Insert Field, select the fields you want to appear on your label. Layout: Bento's Layout tab is where you select a predefined Avery or DYMO label, but it's also where you can define your own labels if Bento doesn't offer the specific label that you need. 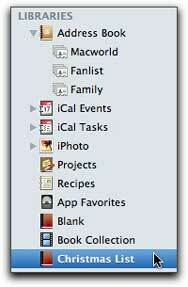 You can use Bento's built-in list of labels or define your own custom label. If you're using a standard Avery label your options are simple and fairly obvious. Find the Avery label number for your labels and then select that number from the list. If your label isn't in Bento's list of available labels, you can select the Define Custom and create your own template based on measurements provided with your labels. When you select Define Custom... you first have to create a name for your custom label template and then enter the measurements into one of the eight available fields used to define the label's margins, how many rows and columns of labels there are, and whether your labels have gutters (spaces) between them. Once you've entered your measurement information the label you create will always be available for reuse. You can choose whether you want to use a contact’s home address, work address, or some other address. Appearance: Bento's Appearance tab offers you several options for changing the way that your labels look when they're printed. You can adjust fonts, font sizes, and colors using the Appearance tab. Selecting the Print Label Border checkbox will print a light outline around each label, helping you make sure that your custom labels will work the way you expect them to. 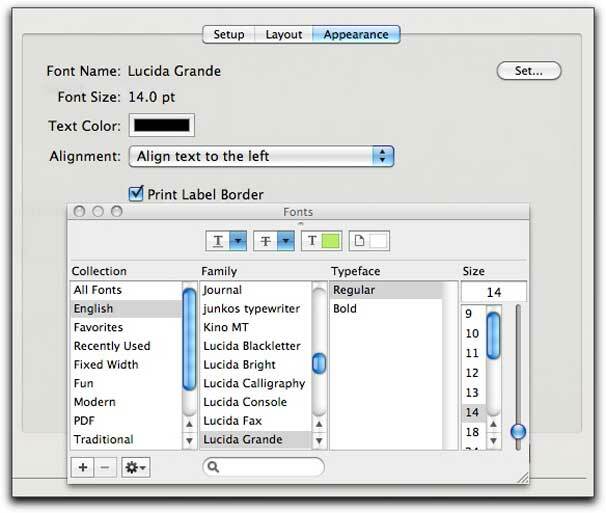 You can adjust fonts, font sizes, and colors using the Appearance tab. 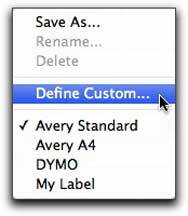 In the Layout tab, select a predefined Avery or DYMO label, or define your own labels. Whether you're printing a form or table, Bento offers the same set of options for the way your data appears when printed, most of which are designed to make your printed data look attractive and not like a screenshot of your Bento database. If you're printing a form or table, Bento's options let you make it more attractive. Under the Print section you have the option of printing only the records you currently have selected in your database, all the currently displayed records or, if you're printing a form instead of a table, you can print a blank form. 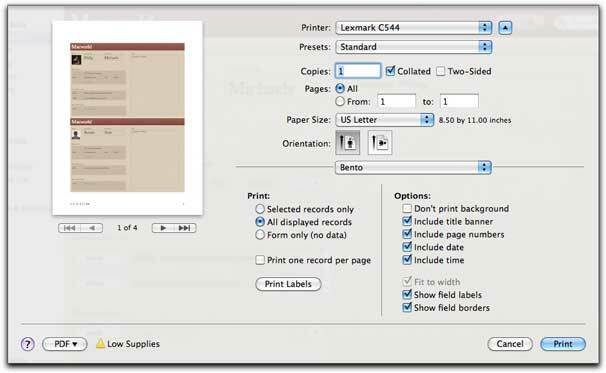 Also, if you're printing forms, you may choose to print only one record per page. The Print Labels button switches you from the Table/Form print dialog to the Label print dialog. The Options section of the print dialog is used to define what your printed document will look like and what metadata information is printed along with your forms and tables. The Don't print background option removes all of the background color from your printed form, which, beyond making your forms look cleaner, will save you a significant amount of toner or ink. Include title banner places the name of the Bento collection you're printing above every record that's printed. Include page numbers, date, and time adds a footer to every page you print and inserts the selected information. Fit to width is only available when you print a table; it shrinks the width of your table so that it does not span more than one printed page. The Show field labels and borders checkboxes reveal or remove the names and lines used to help define your data when working in your Bento database. Bento 4's improved print options make the process of printing labels, tables, and forms more fun and makes the output derived from your information nicer to look at and easier to interpret.